There’s a reason why wine glasses look the way they do. The body is wide to maximise how much of the wine makes contact with the air, but the lip of the glass shrinks to keep as much of the smell inside—but not so narrow that your nose won’t fit. When it comes to tasting wine, your nose is just as, if not more, important than your tongue. The aroma is responsible for what many of us would call the flavour. 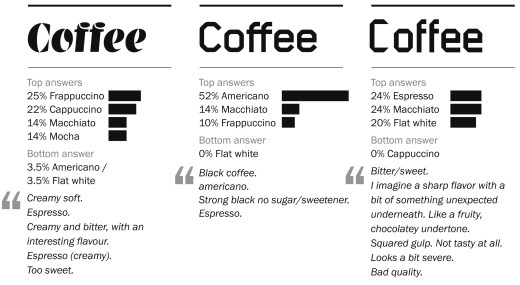 While wine is now heavily associated with the glass it’s served in, coffee doesn’t really have an equivalent. It’s served in round and wide mugs, short and straight, glass or ceramic, or whatever happens to be on hand. But just like wine, the aroma is essential to a good coffee. It’s a bit odd, really, given that some 400 million coffees are consumed every year, that the same science applied to the wine glass hasn’t been applied to the coffee mug. That’s slowly changing, however. And it turns out the ‘drinking vessel’ can do more for our experience than hold the aroma in. Here’s where things get weird: our choice of mug can add to the sweetness or bitterness of the coffee, simply by virtue of its colour. Spence and Carvalho cite a 2009 study which found that people rated a coffee as being sweeter when served in a pink mug. They also mention an entry in a 1964 book (which lacks methodological details, mind you) which found that people felt their coffee was too strong when their mug was brown, weak when it was in the yellow, mild in a blue jar, and rich and full-bodied in a red pot. Coffee can be sweet or bitter and it turns out so can the mug. What’s more, when those features match, people enjoy the end result more. People associated pink with sweetness and green with acidity, while yellow went both ways. So sweet coffee in a pink mug is better than sweet coffee in a green mug. Colour aside, the texture and shape of the mug also have a role to play. People seem to associate sweet notes with round shapes and bitter with more angular shapes. Rougher textures lead to a drier aftertaste. Sarah Hyndman is also familiar with manipulating taste buds. She found she could make jelly beans sweeter by changing the font they were presented with. 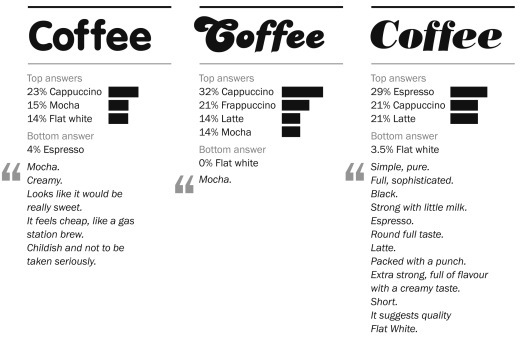 She did something similar with coffee, and found that certain fonts would be associated with particular styles of coffee. Something pulls us towards naming the round shape Bouba and the sharp shape Kiki. The vocal and visual qualities overlap. 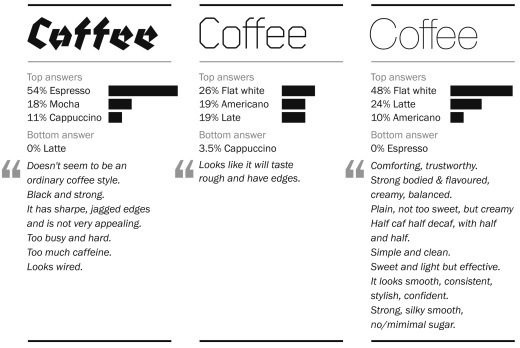 It can work with preferences too—Hyndman, in addition to matching fonts to coffee characteristics, found that 20% of women would most like to date Franklin Gothic. That’s not a person, it’s a font. When Charles Spence asks if lemons are fast or slow, there seems like an intuitive answer to a question that doesn’t make any literal sense. Lemons are fast, of course, and prunes are slow. But when talking about metaphors, or naming shapes, or discussing which font we’d prefer to take out for a nice meal and a movie, we’re generally aware of what we’re doing, even if we know it might be illogical. When Spence makes potato chips tastier by making them crunchier, or coffee sweeter by pouring it in a pink mug, or Hyndman makes jelly beans more sour by altering the font she uses to present them, these things generally evade our awareness. We have a complete experience without realising that some features are influencing others. Perception is a funny thing, and these studies highlight how our rich sensory experience is more of a whole than just the sum of its parts. Next time you find yourself disappointed by the coffee you’re drinking, realise that it might not be the coffee but the thing you’re holding it in. Previous Post Are Colours Easier to Read than See?